Minimum floor thickness can be important in renovation processes in order to avoid extra work on doors and thresholds. For these projects our Bluethermal® Mat range is the ideal product. 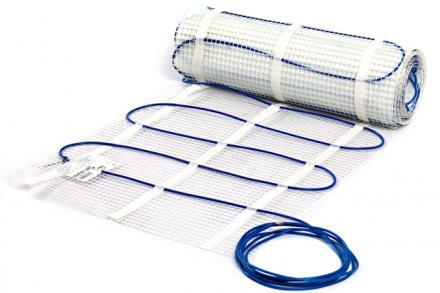 The heating mat consists of a thin twin conductor heating cable attached to an adhesive flexible glass fibre net. The thin heating cable has a total thickness of only 4mm, is delivered with a 2.5m cold lead and has a width of 0.5m. The 100W/m² mat can be installed on any type of levelled and stable sub floor, and can also be used under parquet or other wooden floor coverings. The 150W/m² must be installed on a non-combustible leveled and stable sub floor. With all our products we recommend the use of our Bluethermal® Thermostatic Controller thermostat with a temperature limiting function. Vent-Axia offers a 2 year standard warranty on underfloor heating and their components from the date of purchase. A 10 year extended warranty is also available upon completing the ‘Warranty Form’ found in the Fitting and Wiring Instructions. Stock Ref Model Mat Area Output Dimensions Dimensions Element Nom. The Vent Axia Electric underfloor heating thermostat gives precise and accurate temperature control of your electric underfloor heating. The design of the electric underfloor heating thermostat is unique and every detail has been carefully designed, paying special attention to aesthetic appearance, user-friendliness and quality, Our electric underfloor heating thermostat provides a floor temperature limiting function as well as monitoring the room temperature ensuring compliance with the building regulations. Heating cables in combination with an accurate thermostat are one of the most energy efficient heating systems one can have in a modern building. The design of the thermostat is unique. Every detail has been carefully designed, paying special attention to aesthetic appearance, user-friendliness and quality, as required and demanded by both consumers and professional installers. In the unlikely event that you need to repair our heating cables, this kit provides you with the necessary joints to get your systems back running.